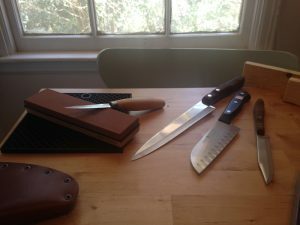 Amy Herschleb attended Jim Dillon’s Hand Tool Sharpening class at Highland Woodworking and came away with a new appreciation of working with sharp tools. In this series she will go into thoughtful detail on the 3 methods of sharpening Jim Dillon taught. Today she covers Method 2, Using Waterstones. The next technique we practiced was with Japanese waterstones. Jim recommends Ian Kirby’s book Sharpening With Waterstones, which covers far more material than the title suggests. We began with 800 grit and worked up to 8000. A simple setup for waterstones Jim suggested was to make a wooden rack for the stone that will sit atop a 5-gallon bucket, so that the stone may be rinsed efficiently and the mess contained. In lieu of this in the classroom setting, after the initial soak, we wet ours constantly with a plastic squirt bottle and kept the stones on plastic sheeting. The Japanese stone (specifically the 1000/6000 combination stone) is a great tool for touching up blades after using them, such as in the kitchen, before they can wear down far enough to warrant grinding a new edge. Several weeks later, when I had the chance to visit the shop in Florida, I tried Dad’s DMT Duo-Sharp diamond stone. This one also had a plastic base and was reversible, with a grinding grit on one side and a polishing grit on the other (Dad’s is Fine/Extra-Fine). This I simply kept on the counter near the sink to rinse, then thoroughly dried the stone and base after use to protect the nickel from corrosion. I found this technique to work very well, when I had the angle set by a guide. Without it, I managed to dull a kitchen knife significantly, simply by sharpening at the incorrect–or even an inconsistent–angle. This episode in the kitchen particularly emphasized the importance of careful setup and attention to detail in what risks being considered (by the uninitiated) the least vital of tasks. Meticulous preparation does indeed save you time down the road, as our buddy Young Thomas learned 178 years ago. CLICK HERE to read Part 4 – Amy’s thoughts about the last of the three basic systems of sharpening she learned.